HOW TO GET A HOLD OF THE BEST ROOFING SERVICE AND CHIMNEY CONTRACTOR IN AKRON, OHIO. Without protection from water repellent, all new and existing masonry chimneys are susceptible to water damage, even after they are repaired. Go Pitch Perfect Chimney Saver water repellents come with a 10 year warranty and have been the first choice of chimney professionals for nearly 20 years. The repellent reduces water penetration into the masonry by 99.9% according to ASTM tests conducted at the University of Wyoming. Chimney Saver is 100% vapor permeable, which means it won’t trap water vapors. Go Pitch Perfect can repair any and all chimney issues. A chimney crown is a masonry roof that covers the top of your chimney. It is designed to prevent water from seeping into the masonry below. Water-damaged or cracked chimney crowns can lead to costly chimney repairs. 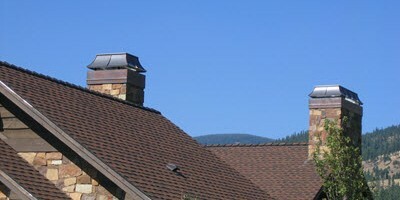 Chimneys are often capped improperly with mortar crowns instead of the recommended cast-in-place concrete crowns. Go Pitch Perfect flex crown solution is an elastomeric coating that forms a flexible waterproof membrane to protect chimney crowns. It dries in about 6 hours and cures in about 24 hours to a natural concrete/mortar appearance and comes with a 10 year manufacturer’s warranty. Chimney leaks are a common problem due to improper flashing design and construction. It takes a skilled craftsman to install a flashing that will perform maintenance free for many years. A common construction “shortcut” is referred to as “pinning” the flashing. This is when the metal flashing is nailed or “pinned” to the mortar, and caulking applied along the top portion of the flashing to waterproof the system. This method is prone to popping loose and developing cracks in the caulking after only a few years of UV exposure. If pinned, chimneys will require constant maintenance to remain watertight. ​Tuck Pointing is a repair that focuses on the mortar joint between brick or stone and does not address the masonry chimney unit itself. There are many situations where tuck pointing is almost a complete waste of money. If you are considering a repair that involves tuck pointing, get a free evaluation from Go Pitch Perfect.